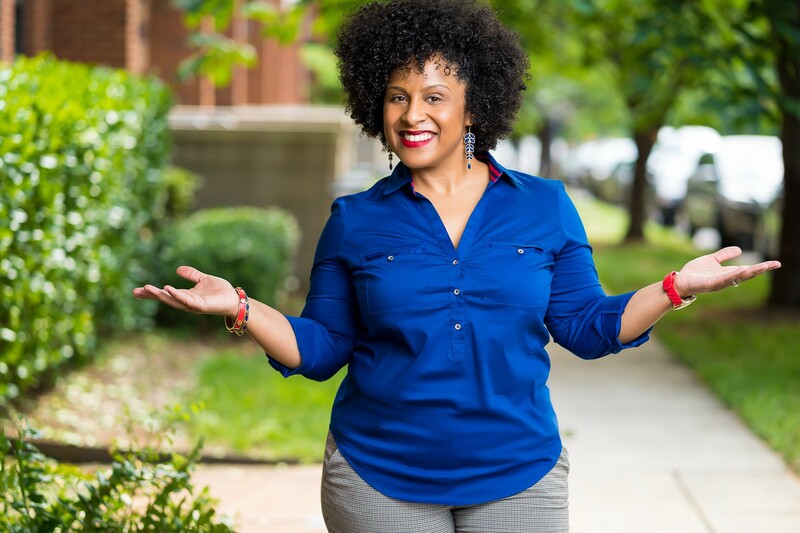 As a part of my series about “Learning To Finally Love Yourself” I had the pleasure to interview Dr. Lisa Folden is a physical therapist and naturopathic lifestyle coach in Charlotte, NC. 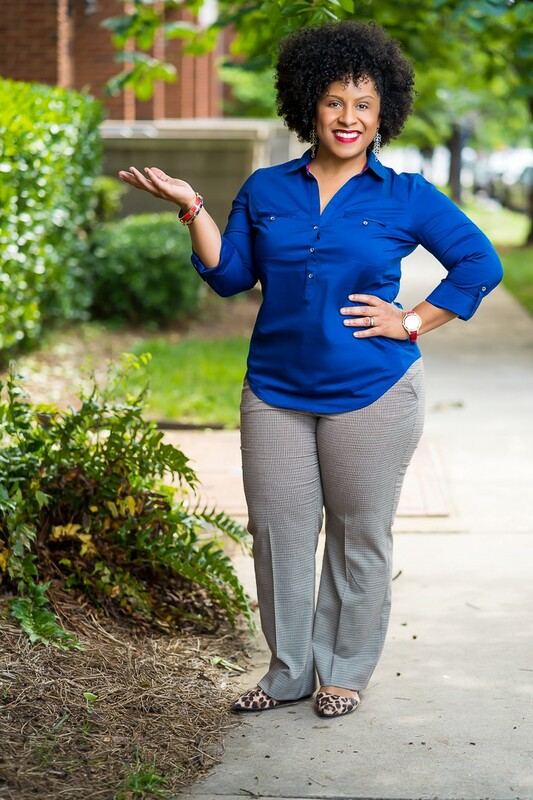 Originally from Detroit, Dr. Lisa is a wife and mom of three who enjoys creating fun workouts, reading mystery novels and taking selfies with her loved ones. The battle to love herself was complicated by an ever-changing body giving birth to three children in 4 years and battling the constant, nagging stigma of NOT being thin in the fitness and wellness industry. Dr. Lisa is now happy and proud to say that she loves herself, mind, body and soul. And she wants to do everything in her power to help others feel the same. Her “PHIT” initiative is evidence of that. Everyone should know that they are Powerful, Healthy, Inspirational and Triumphant, despite their weight, waist circumference, BMI, body fat percentage or any other number/measurement. I, like many young girls, dreamed of being a “doctor” as a child. More specifically, I wanted to be a pediatrician. I was sixteen when I decided it was time to research my future career. So, I planned to speak to my pediatrician during my next visit. Unfortunately, my pediatrician was only in the room with me for less than 2 minutes, so I never got the chance to speak to him about his field. I left that appointment a bit disappointed and decided that maybe that wasn’t the path for me. I knew that I was interested in health, but I was also a cross-country and track runner and dancer. So, I went online and typed “Medical, Sports, Fitness” or something similar and I found term “sports medicine” which led me to “physical therapy.” I read about what physical therapy (PT) was and what physical therapists did, and I was SOLD. I planned from there what college I would attend and how I would go on to become a PT. My dream became a reality and I have never looked back…absolutely one of my greatest decisions and biggest accomplishments to date. Being a physical therapist for more than eleven years and a private practice owner for more than six, has opened me up to more opportunities than I could have imagined. Now, I am a lifestyle coach, helping people with wellness, a published author assisting busy moms with managing their fitness, a contributor on numerous blogs and publications with self-care tips and a public speaker and workshop facilitator. I am living my dream as it relates to my career. I recently published my first book, “Healthy Made Easy: The Ultimate Wellness Guide for Busy Moms.”In that book I give meal prepping tips, sample workouts and overall “life hacks” that help busy women (especially moms) manage their lives by putting their own health and wellness at the forefront. We all know that you can’t pour from an empty cup, but we often need tangible examples and directives about how to “fill ourselves up.” My book helps with that. I was also recently featured in The Oprah Magazine, discussing the best self-care tips for 2019. I am noted in numbers 9 and 12. I am currently working on my second book, due to be released this Spring. It is a quick and easy recipe book for people who want to eat, real food that is healthy and tasty. Most of the recipes will be five ingredients or less and will take less than 30 minutes to prepare. I’m an advocate of freeing up time to do the things we all love, as opposed to the things that we HAVE to do. I hope that when people read my books, blogs and features, that they feel a sense of ability or strength in themselves to achieve whatever it is that they want in life. I hope that they are empowered to follow their dreams and that they have a renewed sense of self-worth and self-love to carry into their relationships and their entire world. I have so many stories that I can recall, but to be honest, most of them lay the framework for why loving myself and accepting myself was so challenging. From being compared to others (physically and mentally), to assumptions being made about what or who I was based simply on my looks. I can recall being traumatized by my natural hair and feeling a sense of embarrassment about the size and shape of various parts of my body. The sad part is, most of these things happened in my childhood. The sadder part…it was often being received from “well-meaning” family members. I cringe to think about it now. Was there a tipping point? Not exactly. It was more of a slow chipping away of a huge rock with a small hammer and chisel. Every time I saw a woman who had something in common with me (thick, frizzy hair, brown skin, wide hips, short stature, etc.) strutting around with confidence that said, “I am just as valuable as the next person,” I became interested, then intrigued, then finally, empowered. Bolder each day and more willing to flaunt my own confidence and walk in the truth of who I actually was/am. Once I became more aware, I started attracting like-minded women into my fold, which later became known as “My Tribe.” Now, I have a circle of women who help to straighten my crown when it’s crooked and who help to lift my chin up when I slip and let it drop, nothing has impacted me more than seeing other women be bold and fierce. These numbers are tough, but not surprising. There are so many causes. On the surface, of course, social media and “society” that defines this SUPER NARROW aisle for what “beauty” or “fitness” is. If we can’t achieve the right measurements, the “perfect weight” or the ideal profile picture, then, I guess we’re just not beautiful and certainly not pleased. But if we dig deeper, these narrow-minded views of beauty come from a deeper and more disturbing place. It comes from within us. Somewhere and somehow, that ugly voice that we hear in our ears telling us we’re not good enough has come directly from us. Somewhere along our lives, we were brainwashed into believing that what we ARE, is not enough. Maybe yours came from watching your mother in the mirror shaming her body. Maybe someone else’s came from a boy in school telling them they were ugly. Maybe mine came from a group of hair stylists refusing my do my hair. I’m sure others have gotten theirs from watching a person in their lives be abused. Even those of us who grow up without some of these negative daily interactions, will still be subject to a television show that depicts a person who does not fit the stereotypical definition of beauty or fitness as unattractive or fat. No matter where we’re from or what we do, somehow, that ugly voice gets to almost every single one of us. It is a daily battle to silence that voice and begin to hear a different and more positive voice. A new voice that tells you that you are enough. A loud voice than encourages you to take care of your body, but never to sacrifice your soul. A constant voice that reminds you that no amount of make-up, filters and camera angles can hold a candle to your natural beauty. Simple, people remain in mediocre relationships because they don’t believe that they honestly deserve anything better. Either they are unworthy of “extraordinary” or it simply does not exist in their mind. Therefore, they stick around for something that is less than what they want and deserve. We’ve watched our parents do it, many of our friends…so why should we have anything special or different? My advice would be to begin the journey of self-love and determine what you actually want in life and in a partner. Talk to your partner in a private and loving setting. Let them know what you desire and ask them if they want the same. If so, great. Then, ask them if they are willing to go on a journey with you to achieve that “extraordinary.” If they are, you are likely in a great space. Try to do it together and see where you end up. If it doesn’t work out, you can both say that you gave it your very best try and there’s nothing wrong with that. Move forward with a better understanding of yourself and what you want. Then, go get it! Agree 100%. Self-love is in no way saying, “hey this is who I am…and I’m not changing.” Being stubborn to a fault is not excused in the name of self-love. We absolutely need to reflect on who we are, who we want to be and what changes and adjustments we need to make to get from point A to point B. What great achievements have I reached so far and what else would I like to do? Am I happy with who I am right now? Do my behaviors match up with who I believe I want to be? What do I believe in and how is that guiding my decision making? Where do I see myself in 10 years, physically, mentally, spiritually, emotionally? Am I satisfied in the direction of my life currently? What decisions have I personally made that have ultimately been beneficial to me and which ones have not? What areas of over-indulgence might I need to get in check? What things should I be doing more to add to my self-worth, self-love and contribute positively to the lives of others? I have had to ask myself many of these questions in my journey to self-love. Specifically, I had to address what I wanted for my life in ten years. I had to literally WRITE the vision. I had a list of in-depth questions that I answered as a part of a church activity in my twenties. The answers to those questions formulated my ten-year plan and the steps I had to make to achieve my dreams. I’m proud to say that I took those steps and that I achieved my goals. I still have the document and I revise it every few years to reflect what’s next. I hope to share it with my children one day. Very important to be comfortable with and to enjoy being alone. Simply put, if you LOVE someone, don’t you want to spend time with them? Of course, right!? So, alone time is vital on the road to self-love. Take some time to get to know yourself. We do evolve, just like everything and everyone else. What we once liked, we may no longer like. Get some uninterrupted time alone to get reacquainted with yourself. Achieving a deeper level of self-love and understanding is probably the largest contributor to having deeper relationships with others. If you truly know who you are and what you want, you can make yourself fully available to others for open, honest dialogue. Open and honest communication is one of the primary building blocks to a deep, fulfilling relationship. That’s only the beginning, but such an important step. Individuals and society need to embrace differences and individuality as much as possible. Encourage people (your children, friends, strangers) to be true to themselves. If you are in a position to showcase different versions of beauty to challenge the status quo, DO IT. Utilize people with visible (and invisible) differences in the media so that EVERYONE can feel represented and valued. Most of the work that can be done might be most effective for children. Teach them that the beauty in this world comes mostly from our differences and that everyone is worthy of love and respect. Give them opportunities to showcase their talents and give them the tools to stand up to bullies (and anyone that attempts to lessen their self-worth) in a positive way. Parents make a point of protecting your children from self-destructive conversations (in person or on television shows) before you have had the opportunity to confirm their self-worth. I repeat positive self-affirmations as often as possible. I also post them around my home and office to keep me reminded and inspired. I started doing this when I noticed that I was thinking very negatively about my personal life. I had to retrain my brain and remind myself that I deserved good things because I was (am) a good person. I spend some time in the morning breathing deeply, in prayer and meditation. Connecting with my creator reaffirms my value and reminds me that my life has greater meaning. Throughout my life, when I skip this part of my day too often, I begin to notice that my mood is less pleasant, and I am less happy and satisfied. I check myself out in the mirror…naked…regularly. LOL. This may sound funny especially after my mention of prayer, BUT I believe that I was created in the image of my creator and that I’m actually beautiful, even with 30 extra pounds or stretch marks or wrinkles. With body changes, it’s easy to decrease your self-worth and believe that you are somehow less attractive or less worthy of love. But it’s not true and we all need a reminder from time to time. So, looking at yourself is a good place to start. I often use this in my practice with my wellness clients who want to lose weight. Many of them refuse to look at themselves in the mirror. Step one on our journey together is SEEING yourself and being comfortable right where you are. I take at least one solo staycation OR vacation yearly. As we’ve discussed before, alone time is very valuable. Getting reacquainted with yourself works wonders for your self-love. Check out a blog post I wrote a while back about my first solo staycation. https://www.healthyphit.com/single-post/2017/10/30/Mini-Solo-Staycation-TipsI am planning a vacation alone for later this year. I spend time with other people who love themselves. Sounds simple, but it is the truth. Light attracts light. Hanging with self-esteem zappers, Debbie Downers, pessimists, self-loathing people can alter your mood indefinitely. My advice: Find people who have the confidence that you aspire to have and hang with them. Learn from them. Feed off of their positive energy and then pour back into them. You will all help to keep each other accountable. I found these women when I relocated to Charlotte as a newly married woman. I love listening to my friends’ podcast, Pack Light Podcast https://itunes.apple.com/us/podcast/pack-light-podcast/id1350146312?mt=2It focuses on all things pop culture, relationships, etc. The hosts are Kendra Allison, Speech-Language Pathologist and Nedra Tawwab, Licensed Clinical Social Worker. I also enjoy reading different devotionals from my YouVersion Bible application on my phone. There’s a devotion for every topic under sun. I’ve found it helpful for navigating my recent grief over losing my grandmother and mother. Thank you! It would most definitely be my PHIT movement! Inspiring people to know and believe that they are Powerful, Healthy, Inspirational and Triumphant! Your size, weight, BMI nor any other number can define your level of worth. Loving yourself and believing in yourself goes far beyond your pants size. I learned this in elementary school and it sticks with me to this very day. I learned then that I was important and that I could do ANYTHING that I put my mind to. It was extremely relevant because I grew up as a poor, Black girl in Detroit. There were people that expected very little of me, but there were just a few that told me that I could be anything that I wanted. Fortunately, I believed THEM, and I worked super hard to defy my surroundings. I finished high school with honors, completed my Bachelor’s degree on a full academic scholarship, I completed my Doctorate degree in physical therapy and started my private practice. I married a great man and I am now the mother of three amazing children. My life has not been free of drama and sadness, but there has been far more good than bad and I am pleased and blessed. And I wish nothing less for everyone else.